When a cold wind blows from the north, the citizens of Arcadia know trouble is brewing. Icewyng the fearsome Frost Dragon has set its icy gaze on the city! Unless its heroes can stop squabbling for a moment and unite against the greatest foe they've ever faced, Arcadia will crumble under a deadly winter. 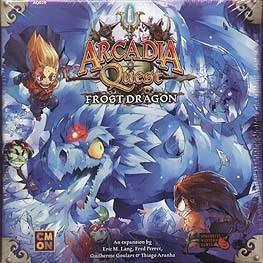 Arcadia Quest: Frost Dragon is an expansion that extends any campaign in the Arcadia Quest line into a truly epic encounter against the gargantuan Frost Dragon! Divided into two scenarios, Heroes will first need to compete to bring down the dragon, and then cooperate to ultimately defeat it. Equip your Heroes with amazing Level 6 upgrades, gain legendary Arcadian relics, and conquer the power of the Frost Dragon itself! You'll need all the help you can get against the icy powers of the mighty Frost Dragon, which can freeze your weapons and trap the Heroes in a cage of ice. Take your Arcadia Quest campaign to a whole new level. Against the Frost Dragon, you will unite or you will freeze!